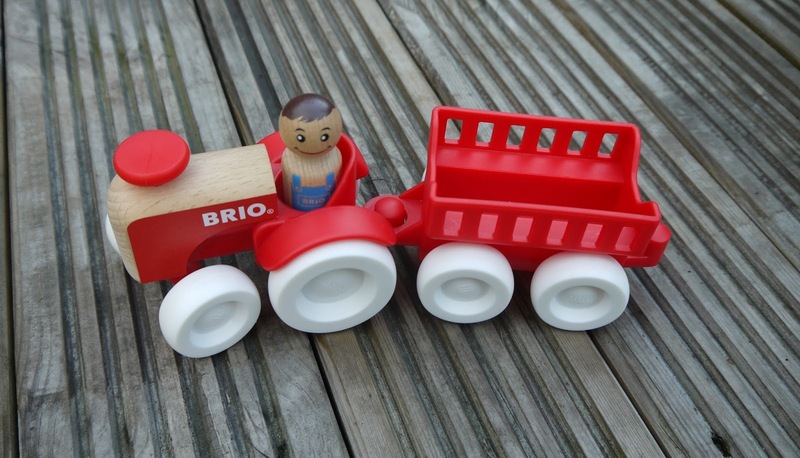 Hello lovelies, today I have for you one of the first toys collection range from Brio there Farm tractor set, my kids love vehicles, anything with wheels they can push along they absolutely love so when this came through the post for us to review they were very happy! That happy I apologise for the missing horse, Lawson grabbed it and ran of with it and anyone who knows one and a half year olds, when they have something it is theirs! So no horse in the picture once we opened it but hopefully you can see the lovely wooden horse above inside the box and the lovely attention to detail. 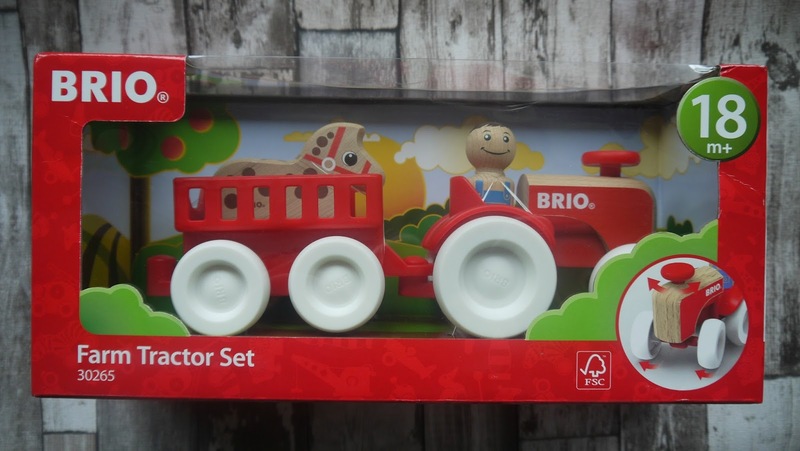 We are already huge fans of Brio in our house, Oscar has a train set which we very luckily won in a Twitter compassion actually and it is so well made, the quality is top notch and you just know its going to last for years and years. There is also something I love about wooden toys, if you look after them well you can keep them forever and pass on in the generations, my mum is definitely not like me she throws everything away, I want to keep a lot of my children's things and show them when they are older and so they can show their children. Anyway about the little farm tractor set itself, I love the vibrant red, the attention to detail on the little farmers face and body and the horse. Very sturdy and well built, no tiny things to choke on or to easily fall off, everything is well maintained. I love the fact you can steer the wheels with the little red disc, Oscar and Lawson have had lots of fun playing with this, Lawson loves running of with the horse mainly and Oscar likes taking the tractor to his farm and putting different animals in the back of the wagon and deporting them to different sections of his farm. Once I get my new camera in November I will be filming a lot so will show you some of the play time things we get up to and feature it back to this blog post when we film the farm tractor set. This would make a lovely birthday or christmas present for a little one, it says its for 18 months, my son is almost 17 months and he is fine playing with it, I am always by him when he's playing with things he could choke on though with his boisterous older brother around, Oscar is 4 and has had lots of fun out of this too though. I will definitely be looking more into their range and what other toys they have, Oscar loves his train sets from Brio and like I said they are very well made so well worth the money.